I’m not a dad. But I am old enough that baseball, as it’s played today, looks different than how it did when I was younger. Meaning the conventions I grew up with aren’t really contemporary conventions. Which also means I have quite a bit of advice that won’t interest the kids these days. I’m not a dad, but this reminds me of my dad. My dad was a big dugout advisor when I played in little league. As a kid, I felt that was odd because my dad never played baseball. (As a kid I also believed that you had to have played baseball at a high level to know anything about baseball—-it was a long time ago.) Having immigrated to the United States as an adult, baseball was probably the fourth or fifth sport my dad got interested in. Cricket was his first sport, and as cricket is a bat-and-ball game, I think he felt sufficiently qualified to critique my at-bats. My dad’s go-to advice was to swing at anything close. He hated taking a pitch or waiting for a strike. His opinion was pulled from his childhood conventions: cricket isn’t a sport where batters (batsmen) take a lot of pitches (a delivery). There are a few reasons for this, but basically, the ball (as in the type of pitch that can add up to a walk) or ball-equivalent is incentivized differently in the two sports. So he swung a lot. I have yet to tell him he was ahead of the curve. We didn’t agree on much when it came to hitting philosophy, mostly because his ethos didn’t match mine. Or at least not what I was taught in the time that I was learning. But there was one bit of bleacher wisdom my dad liked to share that caught on with me as well: despite his free-swinging motto, we both hated strikeouts. During my little league days, the highest average rate of strikeouts per game in MLB was 6.67 (2001). From kindergarten to eighth grade—-the grade levels when I played—-the MLB average was 6.45 strikeouts per game. Over the last few seasons, that rate has climbed to eight per game. As a kid, I saw a strikeout every six plate appearances. Today, there’s a K every 4.4 trips to the plate. It wasn’t just league averages that made me loathe strikeouts—-some of my favorite players were contact specialists with high batting averages. One of my favorite non-hometown players growing up was Tony Gwynn. I only followed him for the last seven or so years of his career, but as I discovered more of Gwynn’s box score catalog, I adored him as much for his strikeout aversion as I did for his gaudy hits total. In 2,440 regular season games, Gwynn struck out only 434 times. His career hits-per-strikeouts rate was an astronomical 7.24. He averaged a K once every 5.6 games. The league’s cream of the crop wasn’t striking out a ton either. From 1995 to 2003, the average MVP struck out 95 times in their trophy-winning season. Sammy Sosa’s strikeout total in 1998 (171) was an outlier. Though three of those 18 MVP-winning seasons were “try not to pitch to Barry Bonds” years, the strikeout totals are notably measly: 12 of the 18 MVPs over the length of my little league tenure struck out fewer than 100 times during their trophy-winning season. Three of them—-Barry Larkin (49) in ’95, Ichiro (53) in ’01, and Bonds (47) in ’02—-struck out fewer than 60 times. In the last three seasons, the average MVP has struck out 130 times. Jose Altuve’s 2017 season is the only MVP campaign under 100 K’s. His 84 brought the MVP strikeout average over three seasons down to 123.5. This post is veering into old head hater territory, so I should clarify: I don’t hate baseball today. The game has not been ruined for me because strikeouts are up and generally tolerated. As of May 24th, Kris Bryant has 539 career hits and 512 career strikeouts, and he remains one of my favorite players to watch for that thundercrack-swatting swing of his. Strikeouts don’t bother me that much anymore. Baseball’s sabermetric revolution is itself old enough to have conventions from its earlier days, one of which is that a strikeout isn’t as bad for a hitter as my youth would have me believe. I may not completely agree with this convention on just its most basic proof, but I can see the sound logic behind it. Strikeouts are up; I don’t see that as a crisis. All it really means is that I’m old enough to appreciate ballplayers who line up with what I liked as a kid, no matter how anachronistic my preference is. Ballplayers like Albert Pujols. Pujols recently crossed the revered 3,000 career hits mark. His latest achievement highlighted his many other feats and the company that fantastic career totals put him in. A personal favorite is that he and Hank Aaron are the only two players in MLB history with over 600 home runs, over 3,000 hits, and over 600 doubles. 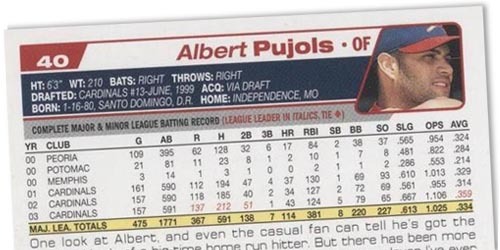 But my absolute favorite thing about Albert Pujols’s career is that, in 17 full seasons, he has never struck out 100 times in a year. His single-season career high is 93. Where Bryant’s hits per strikeout rate is 1.05, Pujols’s to-date number is 2.57. It’s not a Gwynn-ian number, but it is a number I can personally appreciate. In his send-up to Pujols’s accomplishment, Tim Kurkjian relayed an anecdote involving Tony Gwynn. Many years ago, Kurkjian had asked Gwynn which player reminded him most of himself. To Kurkjian’s surprise, Gwynn chose a young Albert Pujols. Gwynn’s logic wasn’t specifically about strikeouts—-his choice was based on Pujols’s knack for hitting the ball where it’s pitched, a generation-spanning dad-ism in its own right. But it implied a contact connection, a specific approach to hitting that put the ball in play and avoided swings-and-misses. It’s not the most contemporary approach to hitting, and contact of any kind for the sake of it isn’t a good strategy, but a link to a nostalgic baseball ideal is the secret sauce to a dad-ism. I’m not quite curmudgeonly enough to start making unsupported claims of a right way of playing the game, but in Pujols, I have a tie to some dubious wisdom whose veracity is almost wholly based on something I like personally. That’s a dad-ism if I’ve ever heard of one. I don’t have kids, but I have a baseball-obsessed teenage cousin, two adolescent cousins who are starting to get their coordination honed enough to hit off a tee, and a baby nephew that’s particularly adept at throwing things. I have a burgeoning, youthful, and disinterested audience to tell about Albert Pujols, who never struck out 100 times in a season, and why they should avoid strikeouts too.